Nala went in for what we thought was a knee injury and it turned out that she has low grade hip dysplasia on her left hip. I am completely beside myself. To be honest, I just found out today and had a brief discussion with the vet and we will go into further detail when I pick her up this afternoon, he said that he is going to prescribe some supplements for her. I really hope the meds and supplements work for Nala. I do want to point out that some breeds like pyrs don't mature until 2 years of age. Which means that you can get a bad reading on hips if xrayed before then. I'm not sure when mals mature, but it maybe something to look into and do research on. They like for them to be x-rayed at 1 yr and 2yrs. according to a book I have on Mals. I know they don't fully develop until they are 2. The thing that gets me is the people want to breed Nala's mom again Tonka's breeder said for me to mail them Nala's results with a letter on why they should not breed again. sorry to hear about this unfortunate diagnosis! Like the others have said, definitely put her on Glucosamine! It will work wonders. Hope you and she get some good news soon! I'm sorry about Nala, but I think she can live a long and healthy life with suppliments. Cosequin is good, MSM and glucosomine also help. Maybe get some Rimadyl for bad days and just use it as needed when she's in pain. Gentle massage is also good. There's lots of ways to get her up and going again! Good news, no pain meds since I had some from when she pulled her ACL, I did pick up some Glucosamine MSM tonight and started her on it. They will see her again in 1 month. Light walks no hills on leash, no hiking, running, nothing uphill, no swimming, but wading is wonderful to relax. She also has a fracture on her knee from putting too much weight on it due to her hip, the vet believes it will heal. Also x-rays again at the age of 2 so we can get a better look once she finishes growing. I feel better now that I sat down with the vet, they are really nice and helpful. They said they enjoyed having her talk to them all day. Just wanted to mention something I haven't seen noted here yet- I don't know how it relates to your baby, whether she is spayed already or not, but I know with my girls, they wait at least 2 months after their heat cycles to x-ray hips, as somehow going through a heat makes the hips appear looser than they are at other times. Might be something worth looking into. She has been spayed. I am glad I did it now, even though I had a lot of people begging me to breed her due to her temperment. She is the sweetest little thing and loves everyone and everything. Our chocolate Lab had severe HD and lived with it to age 14. She had arthritis in her elbows that bothered her more than the hips. Do follow your vet's orders but also let Nala tell you how she feels. Our chocolate used to go for hour long walks every day up until she was about 10. After that we shortened the walks, but she still walked every day up until her last year. Our Lab was on the glucosamine chondroitin supplements and we'd use some rimadyl or asprin on occasion as needed. I'm sorry to hear about your girl In its mild form it is a HD livable condition. Biggest thing to remember is what she does now will effect her more in the long run then a dog without HD. So be sure to keep her active (swimming is a great way) and her weight low. 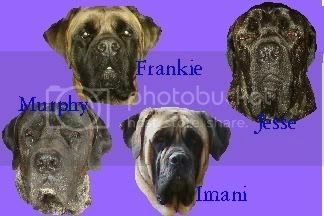 I have a way of picking dysplastic dogs~ have owned 3 so far~ I'm sure there will be more down the road. Bear (now passed) was my first dysplastic dog ~ Found by x-ray at 6 months old. We followed the vets advice to make him less active etc... By age 6 he was on pain killers and by 9 he drug his back leg. Lucci now 10yo was found to be dysplastic at 2yo~ flattened cup, bone spurs, and femoral arthritis. I decided making her stop all dog sports in the hopes of getting a few added elderly years was not the route Lucci would want and continued with her. Now at age 10 she limps (doesn't stop her from jumping the darn baby gates though) and is slow to rise...but is not in "pain" where I feel its time for drugs to be added. However I put her on Glucosamine/MSM when she was 3yo. May now 4yo was just found to be dysplastic. Less then 50% of the femoral ball in socket-no arthritis (yahhhh). She currently is not showing many signs other then the occasional bunny hop. I have both the girls on Pet Naturals hip and joint formulas with Lucci now getting the extra strength with MSM and chondroitin. I feel the adding of these supplements and keeping the muscles up with activities are why she has not progressed to the pain levels Bear had. Good luck and if you have not done so you may want to send the x-rays to OFA so that there will be a record of her lines passing HD. Sorry- OT a bit, but what is MSM? I have all my guys on glucosamine/chondroitin, and I keep seeing references to MSM but have not found anything telling what it is. Thanks! This is what I found on it when I googled it. I was first recommended to try MSM on Lucci years ago by a Human PT RN following a soft tissue injury that did not improve after 6 weeks of cage rest. I found when researching it had been in use on horses for many years. I kept her on it from the age of 3-5 until she retired from flyball. At the time I was not aware that it also had shown to help reduce inflammation and increase circulation at arthritic sites. Almost immediately following going off MSM Lucci started showing the wear on her bad hip. She was then put back on that along with the glucosimine which was enough until this year when I had to add Chondroitin and vit C (forgot about that one). MSM is a natural sulfur-containing compound found in many foods. MSM is normally present in the body of people and animals, but is also available in supplementary form. Sulfur is stored in almost every cell in the body. The highest concentrations are found in joints, hair, skin, and nails. MSM contains sulfur in a form the body can readily use and that is needed for many body functions. Sulfur is necessary for the production of collagen, glucosamine, and chondroitin, which are the building blocks of cartilage. MSM is reported to enhance the structural integrity of connective tissue, and help reduce scar tissue by altering components that contribute to scar formation. MSM has been promoted as having powerful anti-inflammatory and pain reducing properties, and is thought to work by blocking the pain perception in certain nerve fibers before the pain impulse reaches the brain. MSM has shown a remarkable ability to reduce or eliminate muscle soreness and cramps both in geriatric patients and in athletes. It's even given to race horses before a race to prevent muscle soreness, and afterward to reduce the risk of cramping. People with arthritis report substantial and long-lasting relief with MSM supplements. Taken along with glucosamine, a key substance in the process of rebuilding cartilage, MSM can relieve pain and help repair worn or damaged cartilage in joints, ligaments and tendons with healthy, flexible new cells.